Popularized by the German philosopher and intellect Johann Wolfgang von Goethe, for multimedia artist William Robinson, the quote has become a mantra — a way to understand the angular patterns and frigid emotion of his latest muse. From Jan. 21 to Mar. 1, Robinson will keep this quote in his mind as he takes part in the inaugural artist-in-residency at Dalhousie’s Killam Library. 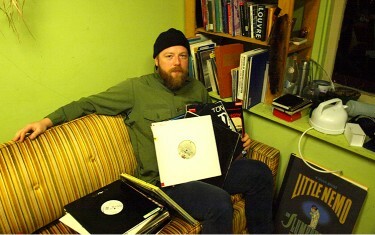 A graduate of the Nova Scotia College of Art and Design, since 2004, Robinson has made a name for himself on a national level with his sonic installations, transforming Halifax’s Point Pleasant Park into a musical jam space in summer 2011 and a Sonic Youth-inspired visual metaphor for idolatry at St. Matthew’s Church later that year. But in November 2012, Robinson heard murmurs in the local arts scene about an upcoming artist residency at Dalhousie University, a school predominantly known in the art world for its music and theatre studies. The residency was the brainchild of Nancy McPhee, a library and information studies student at Dalhousie. An accomplished textile artist and photographer in her own right, McPhee was inspired to launch the program while interning at the Killam Library. Partnering with Peter Dykhuis, the director and curator of the Dalhousie Art Gallery, the two created an open call for local interdisciplinary artists who had a unique research project for the library. Completed on the year of his death in 1971 by Nova Scotian architect Leslie R. Fairn, the Killam Library was inspired by the Brutalist architecture movement—a totalitarian and modernist approach exemplified by a linear and concrete aesthetic. Out of 37 applicants, Dykhuis says Robinson was unanimously accepted due to his unique take on the building’s design. 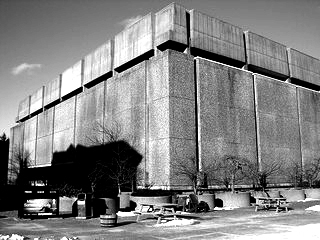 In “Brutalist Song” (the project’s working title), Robinson plans to make a “kinetic sculpture” of the Killam Library. Working with researchers and archivists, Robinson will work with the library’s original blueprints, creating a 3D model that will then be analyzed by an orbiting sensor that will turn the information into sound waves, playing the building as if it were a record from the outside in. During the residency, Robinson will be compensated $500 a week for his research. At the end of his time, he’ll unveil the project during an artist’s speech with the school, but is currently unsure if the piece will be completed after the six-week time period. But for Dykhuis and McPhee, the goal of the project isn’t the final product, but in the research itself. This is next-level random and insanely cool, I cant wait to hear more about this and especially the final project. Happy to hear someone else shares my view of the Killam looking like an Orwellian spacefaring monstrosity (albeit somehow charming). Congrats Will Robinson! I was a contender and although I think I my ‘virtual transmission’ of imagery into the building would have been interactively exciting, hats off to this site specific approach. As a fan of Brutalism of late, I applaud the applause to that modernist design school. Bravo William, Nancy and Peter!